Yesterday marked six months since my brother passed away. I still must remind myself often that he is gone. And my mind has been wearing a well-worn path over the same questions for months. Where is he? What is he doing now? I have been giving a lot of thought to Heaven–not the idea of Heaven as some caricature of puffy white clouds and slightly bored cherubs strumming harps, but the reality of it–a place of extraordinary beauty and peace where my brother has been reunited with God. The story of his near-death encounter began when Pastor Don Piper’s car collided with a semi on January 18, 1989 and emergency workers pronounced him dead at the scene. An hour and a half later, after a desperate prayer from a passing stranger, Piper came back to life. His book is a straightforward first-person narrative in which Piper dedicates two chapters to describing his time in Heaven. He also shares the journey through his painful recovery and reflects honestly about the spiritual and emotional letdown of getting a rare glimpse of heaven only to end up back on earth. His story reminds us that God’s plans are bigger than anything we could understand or imagine–even the darkest and most painful parts of our stories. It’s a message my brother believed with his whole heart. A full-length film based on the book is set to release this Friday (September 11, 2015) and stars Hayden Christensen and Kate Bosworth. Visit the official website for information and showtimes! The movie was produced by Giving Films, a new non-profit that plans to donate ALL film profits to charities in the U.S. and around the world. The list of charities includes Hope International, World Vision and Christian Alliance for Orphans, among others. 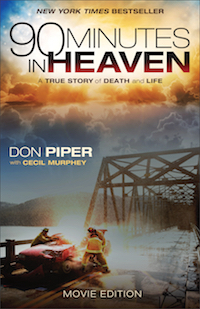 Comment with your thoughts on Heaven and go see the movie! Disclosure: Many thanks to Propeller Consulting, LLC for providing this prize for the giveaway. Choice winners and opinions are 100% my own and NOT influenced by monetary compensation. I did receive a sample of the product in exchange for this review and post. Only one entrant per mailing, per giveaway. If you have won a prize from our sponsor Propeller/FlyBy Promotions in the last 30 days, you are not eligible to win. Or if you have won the same prize on another blog, you are not eligible to win it again. Winner is subject to eligibility verification. When my identical twin, Annie, passed….I read everything I could get my hands on regarding heaven! Thank you for your comment, Mary. You are such a sweetheart. I wish I could have met your sister!